PTSD vs. Common PTS | Crockett Foundation - Tag In & Help Out! Recently I spoke with a Marine Veteran who’s articulate, bright, and living with Post Traumatic Stress Disorder (PTSD). Sometimes people yearn to talk about what’s going on inside themselves – with someone who will understand. Listening, very well, helps build rapport between people. The Veteran and I understood one another, in part, because we’ve both suffered from PTSD. We listened to one another because we are caring individuals. I’m a civilian. My PTSD was in childhood. How is it possible for someone who’s not a Veteran to have PTSD? Being in a car accident and seeing someone die beside you. Being injured, and spending days hoping a search and rescue team will find you after falling off a cliff while hiking. Being in a bank when it’s held up by a gang of people with guns. Being attacked by a dog. Being a viewer of all the 2016 presidential election coverage on television (kidding). There’s a difference between Post Traumatic Stress (PTS) and Post Traumatic Stress Disorder (PTSD). In everyday language the following explains it very well, from Brainlinemilitary. “Common symptoms of post-traumatic stress disorder include reliving a traumatic event through nightmares, flashbacks, or constantly thinking about it. You might avoid situations or people that remind you of the event, have only negative thoughts or emotions, and constantly feel jittery, nervous, or “on edge.” Although some of these symptoms sound similar to PTS, the difference is the duration and intensity. Symptoms that continue for more than one month, are severe, and interfere with your daily functioning are characteristic of PTSD. PTS (without the “D”) is a normal occurrence for human beings as a species. It relates to the fight-or-flight response animals function with all day long. As a child, my symptoms continued for more than one month, were severe, and interfered with my daily functioning. This is a very personal part of my life; not everyone deserves to hear my PTSD story (not everyone deserves to hear your personal business either). Whether you’re a Veteran or a civilian, it’s courageous to talk about your own PTSD experiences. People might become afraid, or make fun of us. As an entrepreneur who’s developing a Veterans charity in the arts, I’ve been building relationships with like-minded Veterans across the country. I’ve built trust by being authentic: the risk I take in talking about my PTSD is calculated and worthwhile to me. Once, when talking with a civilian businessman regarding my Veterans business venture, I shared that as a child I suffered from PTSD. Then I almost punched him really hard in the face! I didn’t punch him – but I do wonder if being punched by a woman would have caused him Post Traumatic Stress (kidding). He wasn’t recognizing that civilians can have PTSD too. I was dealing with someone who chose to be disrespectful of me rather than inquisitive. Getting help for my PTSD from medical professionals and counselors at a young age and also in adulthood after the “D” of “Disorder” fell away helped me a great deal. I’ve learned a lot about human beings. It’s allowed me to position myself beside Veterans – as a civilian – and have common ground. 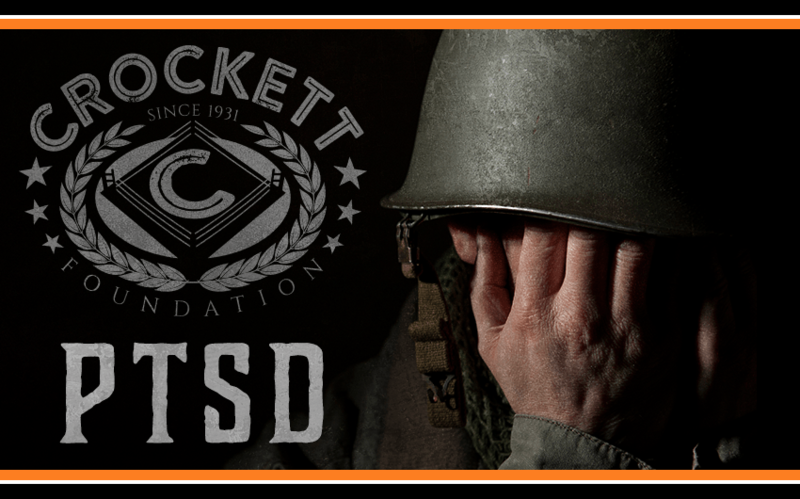 You can donate to the Crockett Foundation and help Veterans living with PTSD.